Pre-season testing is a time of hopes and dreams for everyone in F1. Will a new team’s car be fast? Will everyone else? Luckily, the Badgerometer remembers some stories from testing from the past to give you our Top 5! Adrian Newey is known for designing incredible, title-winning machines, but not all of his creations were world beaters. Towards the end of his spell at McLaren, the car he developed for 2003, the MP4-18, was so revolutionary it didn’t make the start of the season, and the team had to run a modified chassis from the previous year’s car. Upon its inception the MP4-18 was just too technical – it suffered from cooling issues, and as the season wore on the MP4-17D was still in contention for wins and poles. A series of heavy testing crashes for Alex Wurz led to the project being abandoned for 2003, and the MP4-19 was born out of the ashes for 2004. See, Newey doesn’t always get it right! When the 1989 season started in Brazil none would expect that Ferrari would have any chance for making the end of the race, let alone be considered a race winner. 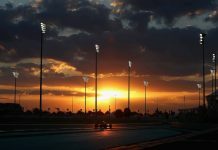 The car had the Italian marque’s brand new electronic semi-automatic gearbox, and the Ferrari 035 had only been involved in two test days before the first race, managing just a handful of laps on each of them. With hopes slim, Nigel Mansell even booked an early flight home from Rio as he had no faith in the Ferrari lasting the distance – only it did, and took him to a famous first victory in the Maranello red. Williams have always been a team to push the boundaries in terms of design, especially if it means capturing that winning formula. Six-wheeled cars had been around since 1976’s Tyrrell P34, but when that design became obsolete it was thought that 4 wheels would be the norm again. But with the advent of turbos and ground effect, teams had to come up with something special to compete. Patrick Head bucked that trend by developing a six-wheel version of the all-conquering FW07, which was coming towards the end of its competitive life. The design path was different to Tyrrell however: instead of four wheels at the front, which aided turn in, it had four wheels at the back, which would mean better traction. Williams ultimately developed two cars with this concept; the FW07D, based on the 1979 car, and the FW08B, which was a development of their 1982 title winning machine. Even as the latter hit the track, there were rumblings that the FIA would look to enforce a four-wheel-only policy, and before the 1983 season began it was made mandatory that all Formula One cars would have four wheels, with two of them driven. Just how competitive Williams could have been with their idea we’ll never know. When Alex Zanardi failed to score a point in his season with Williams in 1999, there was no end of drivers who were in line for the hot seat. In the end, Frank Williams narrowed it down to two: highly rated Brazilian Bruno Junqueira, who was competing in F3000 at the time, and a lesser known Brit from Formula 3, Jenson Button. The competition was fierce, with a test at Barcelona set to decide who would take the seat. 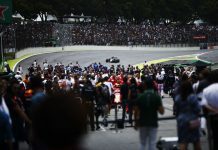 In the course of between twenty and thirty laps, Button came out on top of the timesheets, shading Junqueira by 0.16s to take a slim advantage in the battle to partner Ralf Schumacher. Even though Junqueira had massive financial backing from Brazil in the shape of Petrobras, the Grove team went with the 20-year-old Briton. And the rest, as they say, was history. When Honda closed down it’s Formula One operation in 2008, only the people involved with what would become the BGP-001 knew how good it was. Ross Brawn made the deal that got the car to Silverstone for its shakedown – and he wasn’t disappointed. When it got to pre-season testing at Barcelona and Jerez the car was consistently fastest throughout individual days. Indeed, Jenson Button was almost a second clear one day in Catalunya. Now, knowing how sandbagging and glory runs affect the times, it was easy to think that the car was either running on light fuel or seriously underweight to get sponsors interested. The smiles on the faces of Button and Rubens Barrichello told a different story, however – they knew they were on to something special. By the time qualifying finished at the first race in Australia, the team had locked out the front row by 0.6 seconds and recorded a 1-2 finish in its very first race. The Brawn legend had begun.